You’re never too young to fall in love with a pony. And, if you’re fortunate, not only will you fall head over heels, but you’ll wake up one Christmas morning to find a small white equine with crimson bow around his neck standing in your front yard. I didn’t ask this young rider, 5-year-old Willow Wright, about her experiences with Santa Claus, but I did ask her about her pony, Hillcrest Blue Halo. Before she went into the show ring for the leadline class at The Capital Challenge Horse Show, my friend Lara and I stopped to by chat as she stood at the in-gate. She was maybe “a little nervous” about showing but more excited, and she proudly sat up tall and showed us the proper equitation she would exhibit to the judge when she entered the ring. Indeed, Willow made an impression as she rode to the blue ribbon. When Lara asked about her future riding goals, though, Willow’s eyes grew big when she heard trainer Bill Schaub mention jumping. When Lara added, “Maybe you can jump when you’re 10,” Willow gave an audible sigh of relief. 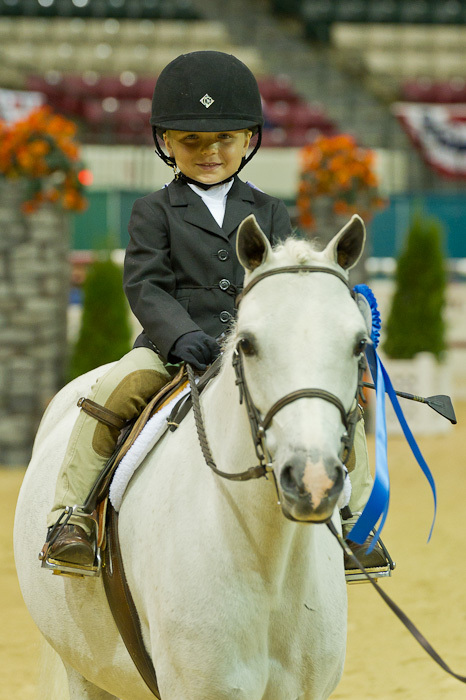 After all, there’s a time and a place for each step in a young rider’s career, and when you’re 5, well, even steering can be a bit of a challenge. Thank you, Nia, for your kind words!